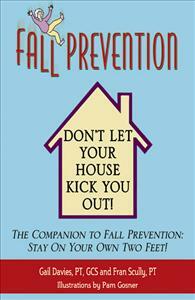 Fall Prevention: Don't Let Your House Kick You Out! This book is a valuable resource for aging safely at home. Physical therapists teach how to identify and eliminate fall hazards and offer simple home modifications and helpful hints. Is your home a fall hazard? Are you in control of where you want to live? As a person who frequently consults and writes for this population and their caregivers, I found this Davies/Scully manual to be concise, readable, and, most importantly, gave the need-to-know information in an easy-to-follow manner. The authors don't talk down to their audience, but use their expertise in this area to impart their own hard-won wisdom and insight. Reading their book is like talking to an older and wiser friend who will gently let you know what you want to know. Also, very cute illustrations! Great for gifts and also great for anyone who's living in an older home--gives info on safety traps people might not think of.